Manager effectiveness has an enormous impact on a firm's success. Therefore, companies must provide instruction for managers and high-potential management candidates in order to help them perform current and future jobs with the utmost proficiency. Management development has long been an important component of corporate strategic planning. In fact, many companies consider the identification and development of next-generation managers to be their top human resource challenge. Management development is important for new managers because these individuals really need instruction on how to perform their new supervisory jobs. Even so, companies often allow employees to make the transition to management with little or no training, leaving them with feelings of frustration, inadequacy, and dismay. More experienced managers also benefit from management development. A majority of first-line managers have their sights set on higher-level management jobs. Given these ambitions, companies need to provide lower-level and mid-level managers with formal development programs in order to help them climb the corporate ladder. Management instruction programs should bridge gaps between what individuals already know and what they need to know for their new positions. 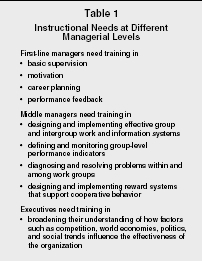 Managers need different skills at each managerial level. The instructional programs needed to produce these skills are shown in Table 1. A variety of approaches are used to teach these subjects. Some are in traditional classroom-type settings, while others are taught outside of the classroom via career resource centers, job rotation, mentoring, and special projects. Classroom training takes place within the organization or outside at seminars and universities. The subjects typically covered in these programs are briefly described in Table 2. Most training experts criticize lectures because they are passive learning devices, focusing on one-way communication to learners who do not have the opportunity to clarify material. Lectures generally fail to gain and maintain learner attention unless they are given by someone who is able to make the material meaningful and promote questions and discussions. Lectures are most appropriate for situations where simple knowledge acquisition is the goal (e.g., describing company history during a new employee orientation session). However, lectures are not well suited to serve as the sole training method for teaching management skills, because the format does not provide trainees with feedback or the opportunity for practice. Job Duties and Responsibilities. Trainees learn what they must do to fulfill the company's expectations of them. Policies and Procedures. Trainees learn company police and procedures. Employee Familiarization. Trainees become familiar with the job functions of their employees. The training provides specific instructions on how to review job descriptions, performance standards, personnel files, and so forth. Attitudes and Confidence. The training attempts to establish new attitudes toward the job employees, and the manager, and to build the confidence necessary for managers to be effective on the job. Handling Employee Interactions. Trainees are taught how to handle interpersonal problems effectively through such techniques as behavior modeling. Career Development. Trainees learn about career opportunities in higher levels of management and how they may advance in the future. General Management Training. These courses typically cover labor relations, management theory and practice, labor economics, and general management functions. Human Relations/Leadership Programs. These topics are narrower than general management programs. They focus on the human relations problems of leadership, supervision, attitude toward employees, and communication. Self-Awareness Program. The content of these programs is understanding one's own behavior and how that behavior is viewed by others, identifying the so-called games people play, and learning about one's strengths and weaknesses. Problem-Solving/Decision-Making Programs. The emphasis is on teaching generalized problem-solving and decision-making skills that would be applicable to the wide range of work problems that managers encounter. As the name suggests, the case method requires management trainees to analyze cases or scenarios depicting realistic job situations. Cases often are structured like a play that opens in the middle of a story and uses flashbacks to describe the action that led up to the opening scene, where an employee has just made a key decision. The rest of the case lays out the documentation and data available to the decision maker at the time of the decision. Questions are posed at the end of the case that ask the trainees to analyze the situation and recommend a solution. For instance, they may be asked to state the nature of the problem, identify the events that led to the problem, and indicate what the individual should do to resolve the problem. The case method rests on the assumption that people are most likely to retain and use what they learn if they reach an understanding through "guided discovery." Trainers act as guides or facilitators. Cases typically do not have right or wrong answers. Therefore, the aim of the method is not to teach trainees the "right" answer, but rather to teach them how to identify potential problems and recommend realistic actions. Critics of this method balk at the lack of direction trainees receive when analyzing a case. What if they arrive at a poor decision? Moreover, trainees do not get the opportunity to practice their skills. For instance, after analyzing a case involving a subordinate who has repeatedly arrived at work late, the trainees may conclude that the manager should have said something sooner and must now provide counsel. However, the case method does not afford trainees the opportunity to practice their counseling skills. What was correct about the participant's behavior? What was incorrect about the participant's behavior? How did the participant's behavior make the other participants feel? How could the trainee have handled the situation more effectively? Role-playing may be used to develop skill in any area that involves human interaction. The method is most often used for teaching human relations skills and sales techniques. Role-playing provides management trainees with an opportunity to practice the skill being taught. It thus goes beyond the case method, which merely requires the trainee to make a decision regarding how to handle a situation. These two methods are often used in conjunction with one another. That is, after analyzing a case and recommending a solution, trainees are asked to act out the solution in the form of a role-play. Critics of the role-playing method point out that role-players are often given little guidance beforehand on how to handle transactions. This may cause them to make mistakes, resulting in embarrassment and a loss of self-confidence. When their mistake-ridden role-play is finished, they sit, never getting the opportunity to do it correctly. Behavior modeling is based on the idea that workers learn best when they see how a task should be performed and then practice the task with feedback until they are competent. This method is similar to role-playing in that the trainees act out situations playing certain roles. However, the methods differ in two important ways. First, behavior modeling teaches trainees a preferred way to perform a task. Second, the interactions occurring during behavior modeling are practice sessions, not role plays. The trainees practice only the right way. If they make a mistake, the trainer immediately corrects them and asks them to repeat the step correctly. Present an overview of the material. This usually consists of a brief lecture that describes training objectives and the importance of the skill to be learned. Describe the procedural steps. The trainee learns the one best way (or at least an effective way) to handle a situation. Case and role-playing methods, on the other hand, stress the variety of effective ways to handle a situation and do not emphasize any one particular approach. Model or demonstrate the procedural steps. The trainee is shown a "model" of how the task is to be performed correctly. The model usually is presented in the form of a videotape or live demonstration. Allow guided practice. Trainees then practice the modeled behaviors. As previously stated, these sessions are similar to role-plays, except that trainees are given feedback by the instructor (or classmates) during the skill practice session, rather than after. This procedure forces trainees to correct mistakes as soon as they are made, assuring them an opportunity to practice the correct way of performing the task. Practice sessions start with simple problems, similar to those depicted in the model. Later practice sessions are made more realistic by adding complexity to the situation. Provide on-the-job reinforcement. Participants' managers often go through identical training programs to ensure that they will understand what their employees are learning and, hence, support these new behaviors back on the job. Behavior modeling has become very popular. Research examining its effectiveness has been quite favorable. Behavior modeling works because it successfully incorporates each of the aforementioned learning principles: it captures and maintains trainees' attention and provides ample opportunity for practice and feedback. Nonclassroom methods include career resource centers, job rotation, coaching and mentoring, and special assignments. Some organizations make learning opportunities available to interested candidates by establishing career resource centers, which usually include an in-house library with relevant reading material. In some companies, candidates simply are given recommended readings lists. Other companies provide management candidates with comprehensive career-planning guides that contain company-related information about available resources, career options, and counseling contacts. These individuals also may be given workbooks that provide written assignments. Job rotation exposes management trainees to various organizational settings by rotating them through a number of departments. Thus, trainees have an opportunity to gain an overall perspective of the organization and learn how various parts interrelate. Additionally, they face new challenges during these assignments that may foster new skill development. Trainees usually have full management responsibility during these assignments. For example, in one hospital new department supervisors rotate through all major departments on a monthly basis, serving in a managerial capacity during their "tours." Although they often learn a lot from such training, they also may make harmful mistakes during their learning period because they lack knowledge of the functional area that they are supervising. Coaching is a method of management development that is conducted on the job, in which experienced managers or peers advise and guide trainees in solving managerial problems. Typically, less experienced managers are coached by their direct supervisor or a coworker on their specific performance of managerial tasks. An upper-level manager is likely to coach several lower-level managers at once, offering feedback, helping them to find expert advice, and providing resources. Mentoring is different from coaching in several ways. Mentors are experienced supervisors who establish close, one-on-one relationships with new managers, called protégés. A mentor usually is someone two or three levels higher in the organization than the protégé who teaches, guides, advises, counsels, and serves as a role model; the mentor is not necessarily the protégé's direct supervisor. Mentoring can help the protégé to form common values with the organization's senior leadership and better understand his or her role in the company. Additionally, protégés are often advocated for and protected by a mentor. A mentor may ensure that the protégé is assigned high-visibility projects, or even change negative opinions about the protégé that may be held by others in the company. While a coach focuses on job-specific advice, a mentor is likely to give advice on a broader range of topics related to the protégé's career success. Companies sometimes assign special, nonroutine job duties to trainees in order to prepare them for future assignments. One such special project is called action learning, which derives its name from the fact that the trainees can learn by doing. Candidates are given real problems generated by management. Trainees might be given a written assignment that specifies objectives, action plans, target dates, and the name of the person responsible for monitoring the completion of the assignment. For instance, trainees might be asked to study the company's budgeting procedures and submit a written critique. Another type of special project is the task force, where trainees are grouped together and asked to tackle an actual organizational problem. For example, the task force may be asked to develop a new performance appraisal form, solve a quality problem, or design a program to train new employees. Trainees not only gain valuable experience by serving on a task force, they also have the opportunity to "show their stuff" to others within the organization. Most organizations base their management development and training efforts on succession planning, a systematic process of defining future management requirements and identifying the candidates who best meet them. Unfortunately, many companies take a very informal approach to succession planning. Identification of high-potential candidates is largely subjective, based on the opinions of the nominating managers, who choose "fast-track" or "superstar" employees with little consideration of the actual requirements of future positions. Research has found that promotions within the management ranks are often based on employee behaviors that have no bearing on managerial effectiveness; specifically, networking had the greatest influence on managerial promotions, even though networking made no contribution to actual performance. Additionally, ill-conceived succession planning activities can have disastrous consequences; as many as 30 percent of all newly placed executives are unprepared for their jobs and ultimately fail to meet company expectations. Elements of an effective succession planning program involve human resource planning, defining qualifications for positions, identifying career paths, and developing replacement charts. The first step in succession planning is human resource planning, in which forecasting is used to determine projected staffing needs for the next several years. Based on these needs, management succession plans should specify key management positions for which staffing should be targeted. Succession plans should next define pertinent individual qualifications needed for each targeted position, which are based on information derived from a job analysis. A firm then identifies individuals with high potential for promotion into or through the management ranks. This is accomplished by assessing employee abilities and career interests through records of career progress, experience, past performance, and self-reported interests regarding future career steps. Following the above steps, an organization identifies a career path for each high-potential candidate (i.e., those who have the interest and ability to move upward in the organization). A career path typically appears as a flow chart, indicating the sequencing of specific jobs that may lead one up the organizational ladder to a targeted job. The final step is to develop replacement charts that indicate the availability of candidates and their readiness to step into the various management positions. Such charts usually are depicted as diagrams superimposed onto the organizational chart. These show possible replacement candidates, in rank order, for each management position. Rank orders are often based on the candidates' "overall potential scores," derived on the basis of their past performance, experience, test scores, and so on. Blanchard, P. Nick, and James W. Thacker. Effective Training: Systems, Strategies, and Practices. 2nd ed. Upper Saddle River, NJ: Pearson Prentice Hall, 2003.